Group Corporate Lessons for your staff ! What type of Dance is Clogging ? Clogging is not dancing in clogs ! Shoes with taps similar to those used in Tap and Irish Dance are worn for Clogging. When first learning, there is no need to outlay for special shoes. Just come with shoes that will slide easily on a wooden floor or a pair of tap shoes. You can even dance in socks to start with. The word 'Clog' comes from the Gaelic word 'time' and applies to percussive dancing in time to the music, usually with the heel keeping the rhythm. Clogging is a fun and exciting combination of Tap dance and Irish dance which gained popularity in the Appalachian Mountains, USA where it was danced mostly to Bluegrass and Country music. These days Clogging is danced to virtually any music - country, rock, pop, rap, bluegrass and gospel. Clogging gained popularity in Australia and New Zealand around 1984 with the first club formed in 1988. The Australian Clogging Association co-ordinate national dances, choreography, workshops and annual conventions. A most appealing aspect of clogging is that it is quite different from other dance genres where choreography is learned specifically for a concert or performance. This choreography is rarely danced more than once or twice. However, in clog dance, once the steps are learned in each level (Basic, Basic Plus, Easy Intermediate, Intermediate, Intermediate Plus and Advanced), one can actually dance to songs they may never have heard of. This is because the songs are cued, meaning that each different step is called out prior to doing it. In most cases, memorizing dances is not required. You can view an example of this in the YouTube video on this Home page. The Association and individual Clubs organise weekend workshops throughout the year where everybody can go along, learn more steps, dance and have a great time. Visit our links page for more information. Clogging is an expressive style of dance with origins in the folk dances of the British Isles, Africa, and pre-Columbian America. Settlers in the American South took elements of these styles to form a unique American dance style, Appalachian Clog Dancing. Through the 18th century, Scottish and Irish settlers brought with them a step dance called 'the clog', characterised by a very erect upper body along with the additional influences of the traditional dance of Native Americans with it's toe-heel, toe-heel movement. Precision (or modern) clogging was developed around World War II. Precision clogging is everyone clogging the same step at the same time. This is the form of clogging danced most often in Australia. Clogging is on the rise in Australia and has earned its place as a modern form of dance. Clogging has gained recognition as a very entertaining and rewarding dance genre for both the dancer and spectator alike. Not only is clogging fun, but it's great exercise and modern medical research has now discovered that dance is the most complete form of exercise for the mind and body. Clogging is danced and enjoyed by all ages and genders and is relatively easy to learn. Why not come along and experience the joy of clogging and dance. 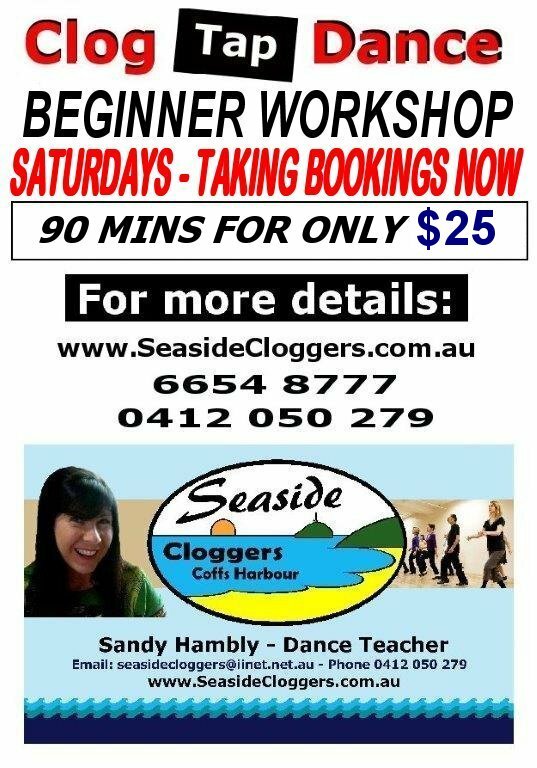 Classes are held at Coffs Harbour. Students can start with us at any time during the year. See the Classes page for more details. If you require more information, or wish to register, phone Sandy on 0412 050 279, 6654 8777 or send us an email via the contact page.﻿ Download the enrolment form via the BLUE link below for Children and the ORANGE link below for Adults. .......Click on the arrows to view the YouTube videos. This dance is an intermediate routine performed at the Australian Clogging Association National Convention. ....This video is of our actual adult class in their third lesson. All the students are total beginners to Clogging. Come and join us. 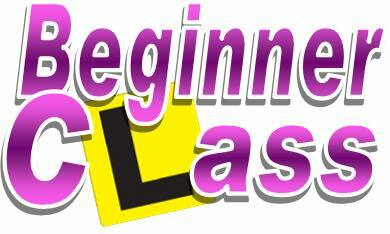 Classes for children 8 years up and adults at Coffs Harbour and Woolgoolga at very reasonable class fees. ....Seaside Cloggers represented at the 2015 Australian Clogging Convention in Niagara Park, Gosford NSW with teacher Sandy Hambly carrying the banner. ...........2015 Australian Clogging Convention - Saturday night dance - Little Piece of Heaven. Hundreds of cloggers from all over Australia come together for Convention each year. ...Fun at our Seaside Cloggers adult Christmas Party.